Welcome to Fluff Engine Toys & Patterns! All Fluff Engine toys are designed by Claire Sanders. Claire makes each toy by hand, using new and vintage materials. Each design is also available as an easy-to-follow instruction booklet and sewing pattern, so that you can make these toys yourself! 2014 Maker Faire in San Mateo, CA! 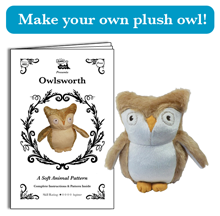 Download the free Owl Pattern on Gumroad!